Female football week is fast approaching, running from the 2nd of March through to the 10th of March. As a part of the celebration of women and girls in football, Subiaco AFC have taken great initiative and are holding a ‘Girls Carnival’ on the 10th of March at Rosalie Park in Shenton Park. They are now taking team nominations for the U14, U16 and U18 age groups that will all be competing on the day. If you have an eligible team that would like to participate in the carnival please email the organiser, Ron Fyneman on ron.fyneman@police.wa.gov.au. Please register with Ron before 4pm on Friday the 23rd of February to be involved. The day will be a wonderful kick starter to the up and coming season and will operate similarly to a round robin, incorporating shorter games. This day is all about enjoyment, fun and celebration. 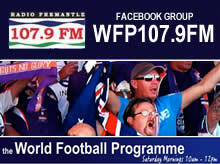 There will be player appearances from our Perth Glory Women’s team along with autographs and poster give away’s. The Northern Redbacks have lived up to their namesake with a convincing 5-0 victory over East Fremantle FC on Sunday. Redbacks’ Demi Vance set the tone for the match with a skilful goal in the 5th minute. East Fremantle responded with some close attempts by McKayla Lyons and Kate Thayer in 19th and 26th minutes, but Redbacks’ keeper Kathleen Waycott was quick on the ball. Renee Leota managed to extend the Redbacks’ lead by scrambling the ball through a crowded square in the 29th minute. East Fremantle came out strong in the second, but shots from Evie Marchetti and Sarah Kenny in the 52nd and 55th minutes weren’t enough to close the gap. Jessica Wheatman, Vance and Leota were able to capitalise on their opponents’ mistakes and add three goals to their tally. 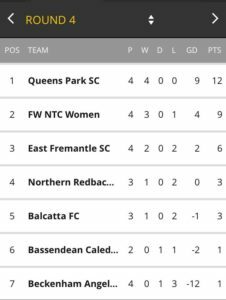 Coming into round six the Redbacks were placed 5th on the ladder with one win and two loses, but the result has lifted them to 3rd place, behind their next formidable opponent NTC. Redbacks coach Tim Hodgson said his team had missed a number of games this season but he is pleased to see them progress on the scoreboard. “We haven’t really had enough games for us to get things gelling properly, but when we did start combining things, we are not too bad,” he said. Hodgson said his team’s line-up included three international-level players, which was the key to their success. “We’ve got experienced players, we play it simple if we can,” he said. Leota played for New Zealand in the 2008 Beijing Olympics, Vance played for Northern Island in the UEFA Championship in 2007 and Kim Carroll has played for the Matildas in the 2011 World Cup. Having won 14 Premier League Championships, Hodgson said the team had let themselves down in a couple of games this year, but it was all forward from here. East Fremantle assistant coach Gary Thayer commended his team for their gutsy performance against a more experienced side. “We are a young team and it is a little bit erratic at times, some are still learning about the game,” he said. “We have just come off NTC which was a big loss, which wasn’t deserved, but in this game we had our chances. NTC Women have produced their second emphatic win in two weeks, defeating East Fremantle SC 5-1 on Sunday afternoon. NTC carried a 2-0 lead into half time and were able to capitalise on the few mistakes their opponents made during the last half an hour of play, to three goals to their tally. NTC coach Jessine Bonzas praised her team’s ability to come out firing in the first half while setting up tough attacking structures that kept them on the front foot. “Going into the half at two-nil is a dangerous score, they get one, and get themselves back into the game,” she said. NTC found themselves a goal ahead within minutes of kick-off, as a perfectly weighted through-ball allowed Liana Cook enough space to dribble ahead and casually slot the ball past the keeper in the fifth minute. The home team were able to double their lead less than fifteen minutes later. A corner kick that spilled out of the box was attacked by Leticia McKenna, who lobbed the ball over the keeper into the back left corner. After comfortably controlling the first half, NTC struggled to keep momentum in the second. East Fremantle applied the attacking pressure early, and a parried keeper save allowed Sarah Kenny to roll the ball into goal. Now only down by one, Fremantle continued to press forward and gave themselves a number of chances to level the score. A shot across the face of goal by Zoe Yao was centimetres wide of the post, and a headed effort by Issabelle Bridges skimmed over the crossbar. NTC were able to wrestle back control of the match and secure the win after a goal in the 73rd minute by substitute Georgia Cawley was followed by a second goal just two minutes later from Abbey Meakins, who was also brought into the game late. Bonzas praised her team’s resilience in halting the attacking pressure and picking their moments to get forward after a lot of defending. “It’s a massive credit to them for holding out, and to hit back,” she said. The home team continued to press forward late in the game as the rain began to fall, and Cook took advantage, easing the ball past the keeper in the 87th minute. East Fremantle official Gary was proud of his team’s fighting spirit, but conceded it was a tough loss to take and that rallying for next week’s game against fifth placed Northern Redbacks next week was now a priority. “We put pressure on them, we told the girls it was only two goals, and we managed to put pressure on [NTC],” he said. “We had a few mistakes, and it cost us dearly. We had our chances on goal, and I think that was the difference, really. “We’ve got a few disappointed girls here, who were a bit emotional – they really wanted to do well in this game. But next week’s another game. 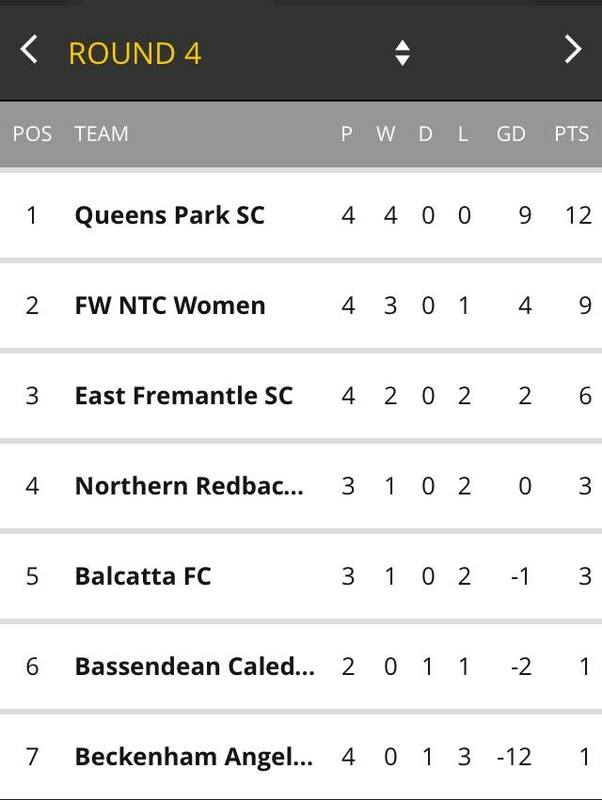 The win keeps NTC in clear second place behind Queens Park, the only team they’ve lost to so far this season. Meanwhile, East Fremantle drop from third to fourth on goal difference, and widen the gap on second place to six points.